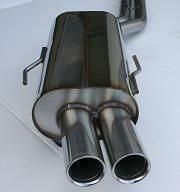 Dyno proven 6 hp gain over a stock E36 M3 muffler. System is a direct bolt-on cat-back exhaust with no cutting or welding necessary. Available with either staggered dual 76mm tips or equal length dual 76mm tips. Staggered tips are similar to the stock E36 M3, the left tip is 5/8" shorter than the right tip to follow the curve of the M3 rear diffuser panel.